Did you know this about freshmen?! A set of facts to surprise you! Practically everyone from our community has already experienced (or definitely will do that in the near future) the thrill and magnificence of being a first-year college student. Of course, sophomores, junior and senior students have already passed such a life stage with pride and honor and currently can look at freshmen with a slight sign of supremacy. Nonetheless, each college student faces several hurdles on the way to success. Some people also note that one becomes a real student only during the second year of studies after surviving all crucial exams and gaining necessary credits for their further step of college education. 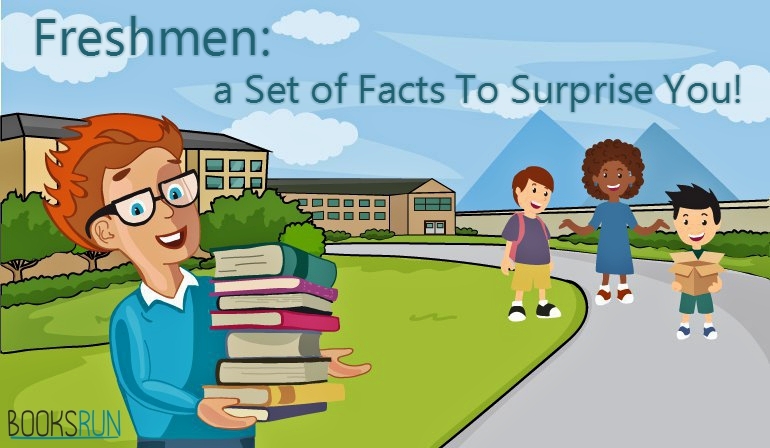 Let’s see what facts will make you feel dizzy as well as excited when even thinking of the first-year studies at college. #1: All applicants generally fear that their college admission will be a complete failure due to some reason. Thus, there is no surprise that “fresh minds” often experience their luck with multiple college interviews according to their list of college preferences. However, the statistics provide us with totally different results that are as follows: it has turned out that more than 76% of freshmen are accepted to №1 college from their wish list. At the same time, such a point can be explained due to the fact that freshmen indeed strive to impress the College Admission Board by intelligence and witty catchwords prepared in the pockets in case of bad scenario. #2: The second astonishing fact is devoted to the self-esteem of a freshman who has already studied for a while at college but has not scored enough credits to pass the first semester yet. Generally, a first-year student has an image of a scared boy or girl whose academic ability is below average in comparison with senior students. Or even vice versa, when the image of a swot or computer nerd whose success totally turns out to be a result of his lonesome lifestyle of a unsociable self-taught smartie arises in our minds. As a contradiction, statistics say that 71 percent of students rated themselves as either being in top 10% of students or above-average in their academic ability. A surprise, huh? #3: It seems that only earlier times dictated their rules when bachelor’s degree was not enough for the career ladder and studying further was indeed a perfect resolution. At the same time, we can easily observe the situation that nowadays the era of businessman has come when people want to earn money with some innovative ideas easily and fast without further educational steps. To oppose this fact, 25% of college freshmen expect to earn a master’s degree according to our investigation. That particular fact implies that students are really willing to succeed in education that sooner or later will lead them to a perfect job position with good annual income as a sweet bonus for their exhaustingly-tough work during college days. #4: We cannot but mention the tuition fee that still plays its crucial role in the possibility to attend the chosen college. No doubt could the student be a gifted person with mental abilities higher than average, unfortunately, sometimes the college attendance can be totally dependent on the family income. Everyone knows how expensive the college education may be, even though student grants and loans are generally provided for all types of students by college board taking into account family’s social position. Still, only less than 57% of high school seniors can afford to attend classes in colleges. And that is the percentage out of 76% of freshmen who have indeed passed the admission! That fact imposes us to reconsider the existing opportunities for talented students attracting the governmental help in such a case to give those people a better chance for their development. #5: We cannot exclude the fact about how much money freshmen spend on books for their studies either. That vital issue has been analyzed based on the parent forums and chats. Of course, taking into account how much can be spent only on the college tuition, parents as well as students themselves, make various attempts to find cheaper alternatives for buying books. According to data, weekly, students may spend from $30 to $300 on their textbooks only, depending on the college campus. No wonder that college freshmen (other students either) are constantly looking for bargains on books to save up a bit. For that reason, nowadays there is a bunch of alternative resources where students can not only buy books but also rent and sell old purchased textbooks to earn some extra cash! Thus, our BooksRun is always eager to help with such obstacles on the students’ way to college achievements! Here you may constantly sell your books back at the highest buyback prices, buy books at reasonable prices and even rent the items at the best quotes offered! Up to a point, we keep our customers updated with special offers and bargains with our newsletters where all the needed information may be found. Numerous coupon codes and various contests may add a perfect alternative for students to earn with us more. So, do not hesitate to contact us promptly and find the best resolution for yourself to save up and spend less money on books at once!